After our recent post about the commercial semi-conductor tester we started a discussion about building a similar open source project. What came up is this AVR based transistor tester (machine translation) by Markus. 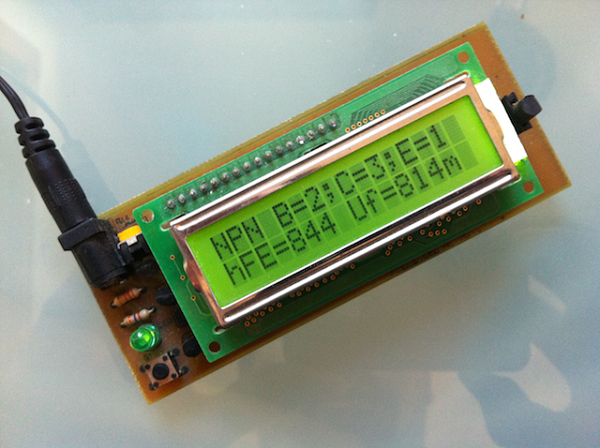 It’s built around an ATmega8 IC that interfaces with a standard HD44780 16×2 character LCD. The circuit that does the testing is simplicity itself. Three pairs of resistors are connected to 6 pins of the microcontroller, and each pair is connected on the other end to one of the transistor pins. NPN and PNP bipolar junction transistors. P and N channel, enhanced and D type mosfet transistors. P and N channel JFET transistors. Common anode and common cathode dual diodes. Two diodes in connected in anti-parallel or series configuration. Arup and Fcobcn have already built one for themselves. Join the discussion and add your input to our development of an open source part tester. This entry was posted on Tuesday, December 13th, 2011 at 6:00 pm	and is filed under Development. You can follow any responses to this entry through the RSS 2.0 feed. You can skip to the end and leave a response. Pinging is currently not allowed. It is a nice device / project. For the DP version I could recommend using different LCD. I feel 2×16 chars resolution is too small. 4×20 chars were better, graphic LCD would be the best. It would be nice to add zener diode detection, and measure the breakdown voltage. This is impressive. Wonder if it could be adapted to test the impedance of an FPGA iostandard. Hey guys I built a version of this using my CNC machine to make the case. Really happy with the device, and very well done in both software and hardware design. I might fiddle a little with the software to unify the display output a little and also attempt to add maybe zener detection and maybe even rudimentary inductor measurement.